This is the Codey’s World 2016 Halloween story anthology, titled A Halloween Reflection. I hope you enjoy reading these stories as much as I enjoyed finding them for you. I’d been thinking about Halloween. Doug and I bought a big bag of Halloween candy at Costco (150 pieces!) for the kids that we expect will show up trick-or-treating. We bought an orange lightbulb to (temporarily) replace the front porch light and give it more of a Halloween atmosphere. We bought a (large, heavy) ceramic pumpkin for our front porch that looks realistic and has a battery-powered LED light inside that flickers like a candle. So we’re ready. AwesomeDude has a bunch of new Halloween stories that you can read through the Halloween weekend. I wondered what I could do to celebrate the holiday on Codey’s World this year. Our (usually) weekly posting always includes a Featured Story, something from the past that we think we think you’ll enjoy reading again — or for the first time. Last week I posted a Featured Story by Cole Parker that is a (spooky) Halloween story. Doing it again this week seemed a bit… too repetitious, perhaps. But not being able to come up with a better idea, I began to search through the Codey’s World archives looking for a Halloween story to post for this week. As I was going through the list I realized that Codey’s World had posted a lot of Halloween stories. Really, a lot! So I got an idea. Instead of posting one Halloween story this week, I could post several in the New This Week section. But which should I pick? There were many! And, like the cartoon characters who have a lightbulb over their head to indicate they got an idea, I got an idea (sans an a actual lightbulb over my head). So, this week I’m posting a list of the Halloween stories that were posted on Codey’s World, sort of like one of the Anthologies that we used to have. There’s a Halloween poem, a Halloween novel, and the rest are Halloween short stories. I think I got them all; let me know if you see any that are missing and I’ll add them to the list. We also have The Legend Of Kiwakaazi ~ Book Four: The Messenger’s Message — Resurrection Chapters 15 and 16 of Book Four of a series of novels by Nanak. 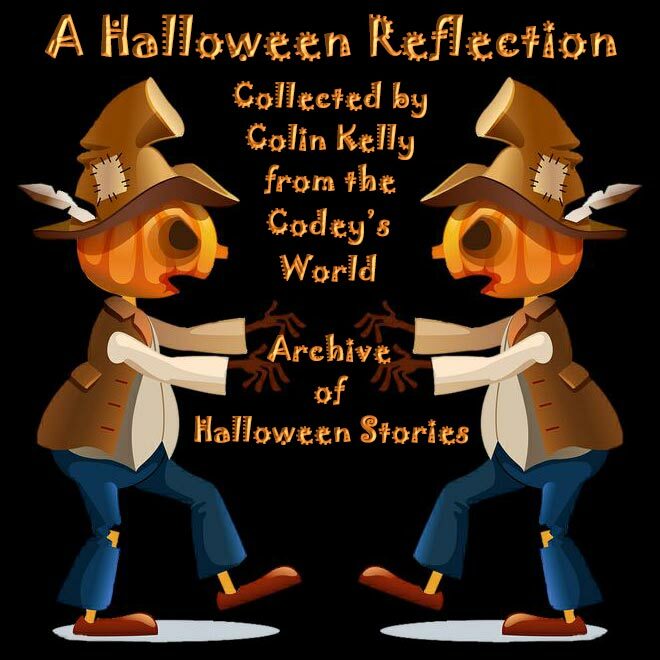 So, this week’s Featured Stories item is the Codey’s World 2016 Halloween story anthology, titled A Halloween Reflection. I hope you enjoy reading these stories as much as I enjoyed finding them for you. You’ll also notice that instead of posting on Wednesday this week, I’m posting on Saturday. Closer to Halloween, is why! We won’t post again until November 7th. I’m taking next week off. If you enjoy these stories, please let the authors know! Authors thrive by the feedback they receive from readers. It's easy: just click on the email link found usually at the top of each story to send the author a message. Say “Hi” and tell them what you think about their story. Thanks, Colin Kelly, Codey's World Webmaster. These stories and the included images are Copyright © by the authors and providers of the images. They cannot be reproduced without express written consent. Codey's World web site has written permission to publish these stories. No other rights are granted. Disclaimer: All publicly recognizable characters, settings, etc. are the property of their respective owners. The original characters and plots are the property of each author. The authors are in no way associated with the owners, creators, or producers of any media franchise. No copyright infringement is intended. Some of the stories in this anthology may contain occasional references to minors who are or may be gay. If these were movies, they would be rated PG (in a more enlightened time they would be rated G). If reading this type of material is illegal where you live, or if you are too young to read this type of material based on the laws where you live, or if your parents don't want you to read this type of material, or if you find this type of material morally or otherwise objectionable, or if you don’t want to be here, close your browser now. The author neither condones nor advocates the violation of any laws. If you want to be here, but aren’t supposed to be here, be careful and don't get caught!